Saturday January 30th the SBG NIAGARA AMATEUR MMA COMPETITION TEAM made it’s Ontario debut in Fort Erie, Ontario at the Underground Combat Series MMA Event. It was a smashing success for the team going 2 -0 in our MMA fights and a dominating performance in our K1 exhibition fight. Coach Justin Cronkwright was the very first fight of the night. Touches gloves, lands a nice teep to the body, big overhand right lands flush and rocks the opponent, takedown, takes the back and sinks in a tight rear naked choke to submit his opponent for the win. All in only 19 seconds. Couldn’t ask for a better start to the night. Coach Peshko fought an exhibition K1 fight. He showed excellent footwork and head movement, good punches and hard and accurate kicks. Both athletes gave a great performance in the cage. One point to make is that this was his opponents 10th fight, and you would be hard pressed to find anyone that would believe it was Pesh’s first fight ever. Coach Jermaine Chandler finished the night for us. He took a clean shot at the start of the fight, and immediately put the guy to the fence and kept him there with superior clinch work. With heavy hips he pressed the opponent across the cage fence and then landed a smashing takedown and then landing some solid ground and pound. Passed the guard, took the back and sunk in the rear naked choke to submit his opponent in the very first round. It was an absolutely amazing way to start our Amateur MMA journey. I would like to mention that we trained for this event at SBG NIAGARA, with our own athletes, our own coaches, our own sparring partners, no ring, no cage. Justin and Peshko have never stepped into a cage or ring until last night and Jermaine was in a cage only once years ago. 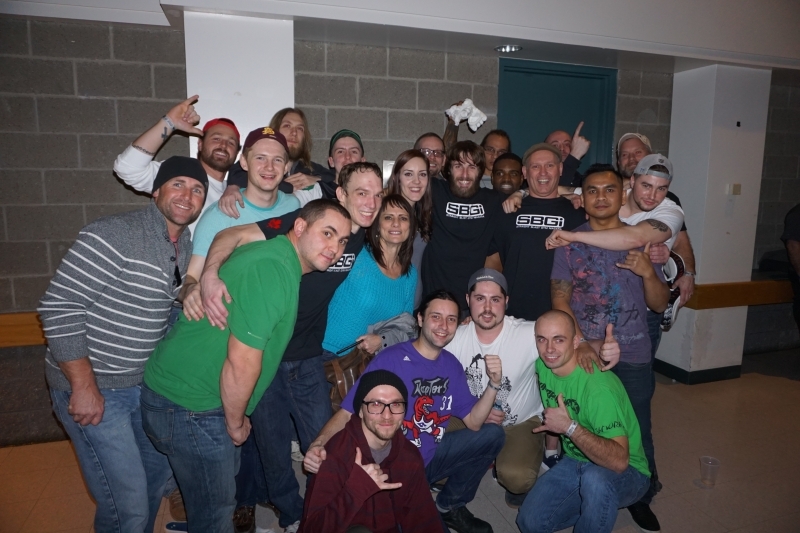 You can have all the toys, rings and cages you want inside your gym, but the most important part of the inside is THE PEOPLE, and that is where SBG NIAGARA excels - the people we attract to our tribe are simply some of the best people you would want to be around! No hard contact training sessions. The SBG training methods are different, and they produce results. As Coach Kavanagh says “we upgrade the software without damaging the hardware”. EVERY athlete at my gym gets my equal attention. There are no favourites with me. From beginner to experienced athlete, they all get 100% from me regardless of who they are and what their goals are. THAT’S HOW WE DO IT AT SBG! The next card is in April, and I will be looking to have 7 of my athletes on it. Last night was simply the start. I have been assembling and preparing my TEAM for some time now. They have trusted me, been very patient, and they believe in what we do and why we do it. And the time has now come to reap the rewards. This is SBG...You will be OK!